Your self-storage unit is only as useful as your ability to utilize the available space. You need to be able to efficiently arrange and store all of your personal belongings while still ensuring that things are stored safely and are easily accessible. 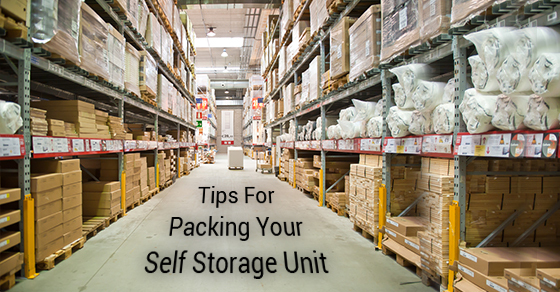 Here are 5 tips to consider when packing your storage space. Arrange the items around a path. For the sake of accessibility, you will not be able to fill a storage unit to 100% capacity. You will need a walkway through the middle of the unit. Even if this means having to place items all the way at the back of a unit, reserving some of the space for a pathway will make your life that much easier when the time comes to add or remove items. Store your items in boxes and label things clearly. Having a well-organized storage unit is the key to getting the most out of your storage space. Uniform sized boxes that efficiently maximize the use of vertical space and which are clearly labeled will save you time and hassle, especially if you plan on using the space long-term. If you put something in storage in May and need to know where those holiday decorations are come December, it may be difficult to remember exactly where and in which box you packed them. Create an inventory list. This goes hand in hand with the boxing and labeling. Having an inventory of exactly what you have in your unit is important, not just for the accessibility factor, but for insurance purposes in the event of a natural disaster. If the unit is damaged by fire or flood, you will have an accurate estimate of the dollar value of the damage and will be able to expedite the claim and reimbursement process. Cover your items. If the company you have chosen to store your personal belongings with is professional, the site will be safe and clean. However, in all likelihood it is going to be up to you to maintain cleanliness inside of the unit. If you are storing furniture, utilize mattress bags, sofa covers and upholstery bags to protect fabric and wood from dust and moisture. Pack bulkier items closer to the walls and tall items at the back. Taking care to pack in this way will mean that your view of what’s in your unit is not obstructed and you have a clear line of sight when you walk into the unit. Self-storage can make your life infinitely easier if space is at a premium in your home or office. But in order to get the most out of your investment, you need to take care to maximize the space provided and protect your items while they are in storage.